I don’t know what it is but every year around Thanksgiving time I get a huge urge to make all things non-food related, of course in addition to food-related things. This year I picked out a few things to make so depending on how productive I am, you may see them more of them here. 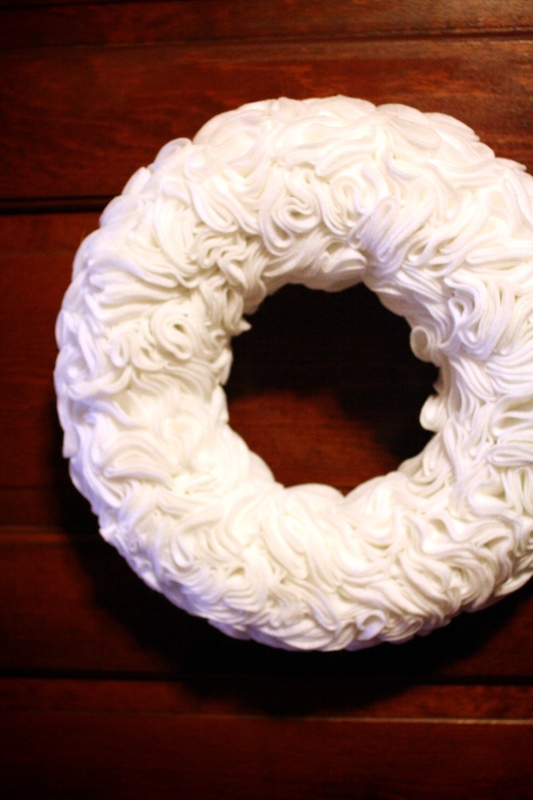 I made this wreath because I thought it looked rather fancy. The instructions can be found over on design sponge: http://www.designsponge.com/2009/12/diy-project-kristens-ruffly-felt-wreath.html It definitely didn’t take 2 1/2 yards of felt but I only filled the side of the wreath that would be seen on the door. Can’t wait to see what else you make!! Miss you. Thanks! PS. I can’t wait to hear how the garland turns out. Too bad you aren’t down the street anymore, I could have offloaded my extra white felt on you. It looks like dead brain coral. Now, everytime I come home, I get suddenly depressed about ocean acidification. Merry Christmas.